Posted By Carlos On May 24th 2017. 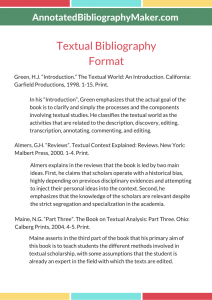 Under Annotated Bibliography Tips Tags: textual bibliography, textual citation, what are textual citations . What are textual citations? This is basically the first question you should ask yourself before you embark on the process of how to write them. Textual citations also known as in-text citations. 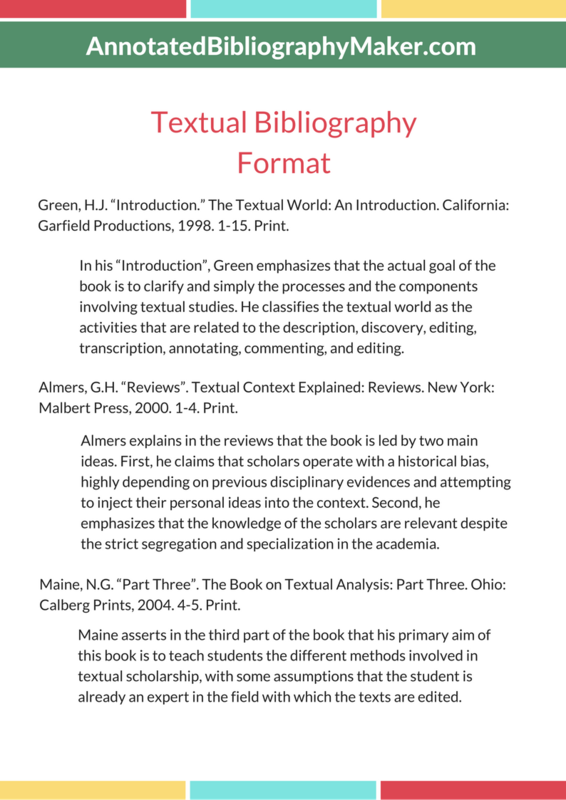 They can be described as a reference that is made within the body of text of an academic essay. It is basically the way you tell your readers that certain material in your work came from a particular source which you have mentioned. It serves to make any reader aware of a source that you used as reference in your write-up. Textual citations are dependent on the type of style you want to use. This may be either APA style bibliography generator format or MLA format. Most commonly, you will find that only the author’s last name, the date of publication as well as the page number from which the quotation or paraphrase is taken needs to be included, with the complete reference appearing fully in the bibliography page at the end of your write-up which could be an essay or a report. Additional information such as information about the author as well as the name and location and company that published your copy of the source could also be included though this is not mandatory. The citation should be enclosed in brackets directly after the text you have quoted or paraphrased. This will make it very easy for any random reader to identify the textual citation. There are special cases where you will present the citations as a superscript number, with the superscript number listed in your bibliography. The condition of using the superscript numbers is only of you will include the superscript in the bibliography. The author’s last name, as well as the year for publication, must appear in that order respectively. A complete reference list should appear at the end of the paper. This implies that all the sources cited in the text must appear in the reference list at the end of the paper. In the case where you are referring to an idea from another work but you are not directly quoting the material or making reference to an entire book, article or other work, you only have to make reference to the author and the year of publication and not the page number in your in-text reference. Make sure that you always capitalize proper nouns, including authors’ names as well as initials. If you are paraphrasing an idea from another work, you are required to make reference to the author as well as the year of publication in your in-text reference. You could also provide the page number. When capitalizing titles in textual citations, capitalize both words in a hyphenated compound word. You should also capitalize the first word after a dash or colon. Italicize or underline the titles of longer works such as books, edited collections, movies, television series as well as documentaries. Put quotation marks around titles of shorter works such as journal articles, articles from edited collections, television series episodes as well as song titles. 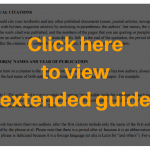 Looking for requirements of historical bibliography example? Click here! Textual citations are very important and they are an effective way of giving credit to the original author by using their work without plagiarizing. Our experts have handled in-text citations for quite a while and you can trust them to assist you write your own citations. We will help you answer the following questions. What are textual citations? How do you go about writing them? We offer help by assisting you with your textual bibliographies. We will aid you by working on them on your behalf at a reasonable cost. Our writing services are quite fast and efficient and as soon as you place an order with us we will work on the bibliography and get back to you within no time. Do you have a questions what are textual citations and how to do it? For the best writing services with regard to bibliographies and in-text citations make sure to reach us!